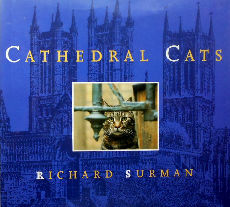 This book is a trip through the cathedrals of England and the various cats who call the cathedrals their home. There are color images of all the cats in the various cathedrals (Canterbury, Gloucester, St Paul's, Westminster, etc.). The hard back book is 7 3/4" square. Printed in England it is copyright 1993, 87 pages, color photographs throughout. Previously owned but in good condition.